GTL: Valentine's Arrangement. Oh, and GIVEAWAY announcement! It’s GIVEAWAY day! If you’re too antsy to wait, you can enter to win our fab prize by scrolling to the bottom of this post to get the deets. Prepare to be blown away. 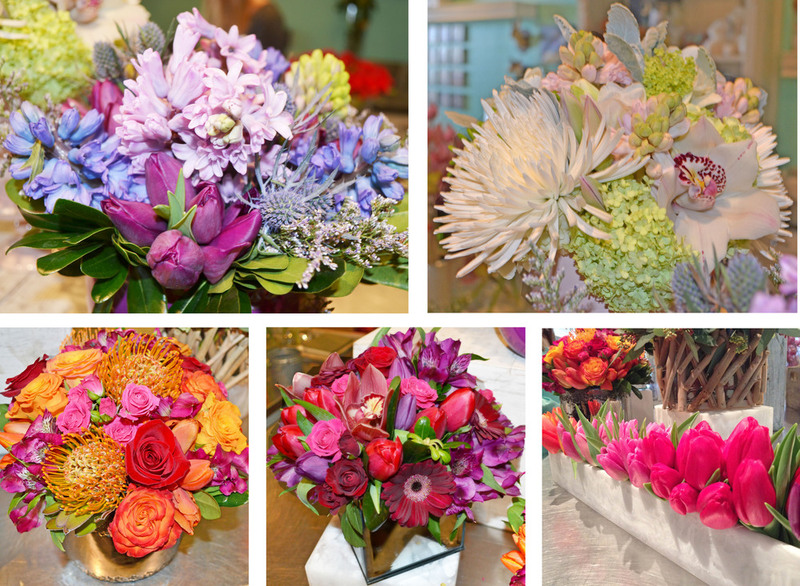 But seriously, check out this post for floral inspiration that’s to die for. Have you guys been to Swish Flowers yet? If you’re in Edmonton, it’s an absolute must for flowers. I’m lucky enough to live minutes away and have adored them for years, but more recently have gotten to know some of the fabulous ladies behind the name. I was lucky enough to finally meet and work with Sheryl Asp, Swish’s owner and creative floral genius (understatement, trust me) when I asked her to create some arrangements for some of my clients. Needless to say, getting to showcase the amazing works of art that come out of Swish had to happen. 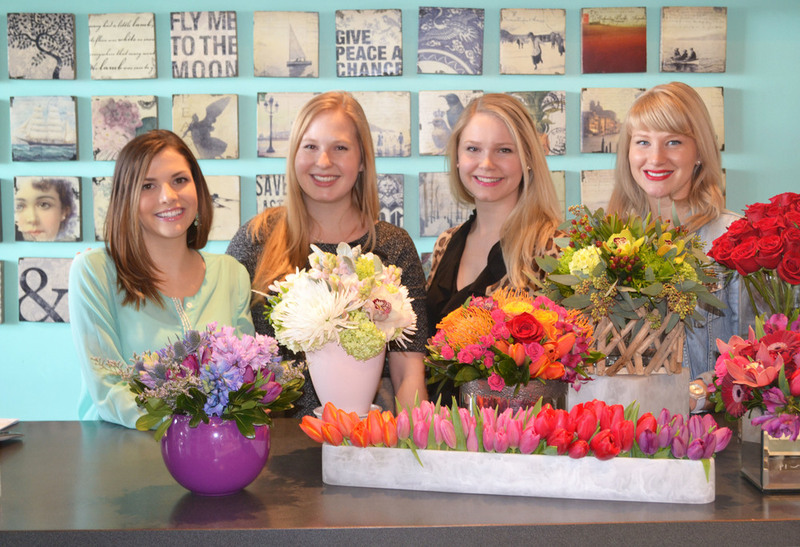 In a twist on our usual GTL (that’s Get The Look if you’re new here), the ladies of 204 Park spent some time with Swish’s own Jill Hestbak and learned how to create a stunning but completely doable Valentine’s Day arrangement. Grab a coffee, sit back, and relax… I have sooo much to share with you today! Let’s start with the GTL. 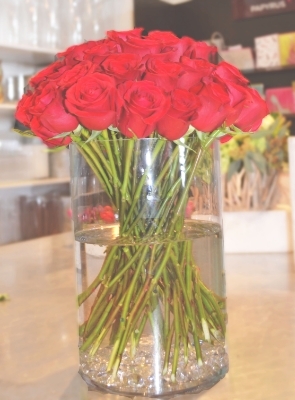 A dozen red roses is classic and always appreciated by a lady… or a gent! But what about four dozen red roses? Now you’re talking! Jill (very patiently) showed us how to create the show stopping arrangement that I’ll break down for you today. The key elements are a tall, cylindrical vase, as many roses as you can get your hands on, some decorative crystals/pebbles for the bottom of the vase, and a knife. Step one: de-thorn your roses. Trust me. Step two: prep the vase by placing the crystals in the bottom and fill it about three quarters of the way with water - just like that. And now the real fun begins! Step three: each rose needs to be cut to the perfect height with a knife. This is important! Unbeknownst to me until now, using scissors will somewhat crush the stem of your flowers and make it harder for them to absorb water. These are the little details that you only learn by talking to someone in the know. Jill also peels the outside of the bottom inch or so of the stem to create a greater surface area for water to be absorbed. See how much we’re learning here?!? Game changing moves, people. Jill showing me her skills with the knife. I think she's a bit afraid when I take over. Step four: The most important detail- the precise placement of the roses and their stems. This isn’t a throw em in and hope for the best kind of arrangement, if you hadn't noticed. A huge part of the wow factor here is the precision of the stems and the shape that they take in the vase. Jill started by positioning the roses side by side along the rim of the vase with the bottom of the stems angled towards the center of the vase. As she added rows of flowers, she carefully placed the stems into the center of the now growing collection of stems, following the same order as the first row. Following her lead, we were able to keep the pattern consistent and beautiful. Thanks for all the help, Jill! 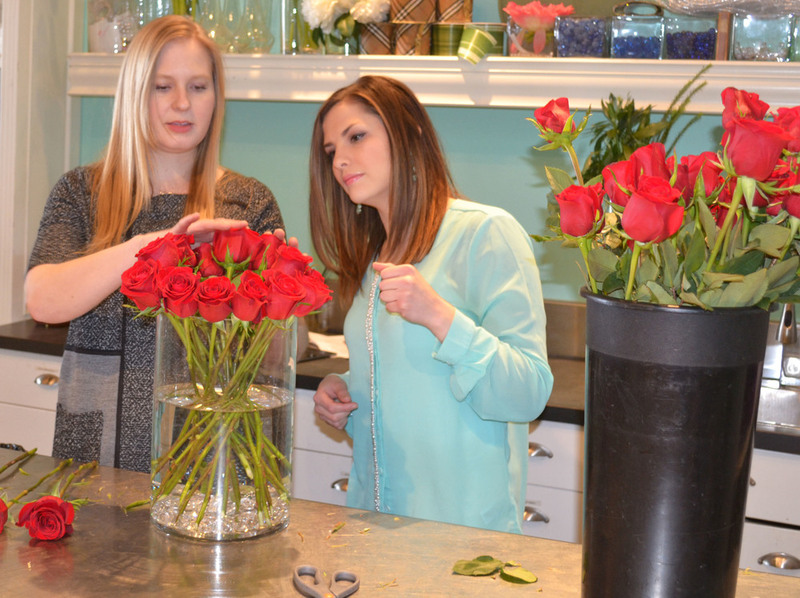 Kali and Diana putting their decorating eyes to the test with arranging the roses. As we watched Jill expertly slice and arrange and create, we asked her if she had any tips to help us keep our arrangements looking like new for as long as possible. The two most important details are so easy, even we can do them: 1) Again, use a knife rather than scissors to cut your stems, and 2) Fresh, clean water is essential. Change the water in your vase ever three days to keep your blooms happy. And that’s it! I could end this post here. But I’ve got soooo much more for you... because there’s no such thing as too much when it comes to beautiful flowers! So, not only did Jill create the stunning arrangement that we see above, but she also just so happened to whip up more totally unique and fabulous options to satisfy every taste and occasion. 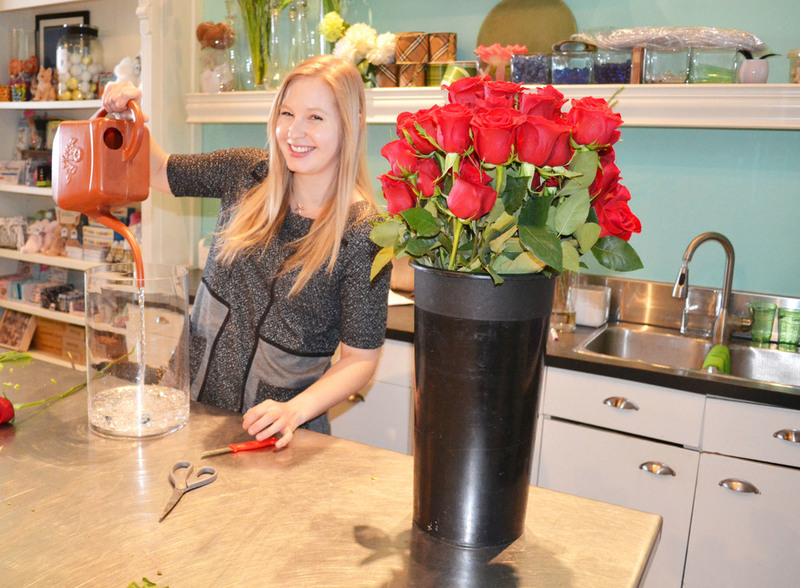 Look at the creative and beautiful arrangements created by Swish for Valentine’s Day! So creative and fabulous. Ok, the time has finally come. You’ve been patient enough. Let’s talk GIVEAWAY! Flowers on their birthday…. For the rest of their life. I’m dying! Can you imagine? Kali, Diana and I all questioned whether or not we should just quit this whole blogging thing altogether so that we could enter our own names in this one. Ok, not seriously… but almost. To enter, simply follow 204 Park and Swish Flowers on Facebook and Instagram (Swish has just joined! Let's give them a warm Insta welcome) by clicking the entry form below. Select all of the options to maximum chances to win! You have until the end of Valentine's Day- midnight, February 14th (Mtn Standard Time) to enter. We'll announce the winner on Saturday, February 15th. Good Luck, lovelies!! Please note: the winner is responsible for picking up their flowers from Swish or for covering the cost of delivery if preferred. We are SO lucky to be able to give away such a fantastic prize and want to thank Swish Flowers from the bottom of our hearts for such a fun time learning how to create a beautiful floral arrangement (or six) and for this amazing prize. Thank you, ladies!